SUCCESS STORY - KVK SULTANPUR U.p. Name of Farmer - Sri Virendra Singh, Sultanpur U.P. TITLE : Hybrid Chillies boosted the income of farmers. Introduction : In district Sultanpur cultivation of vegetables has been taken momentum since last 20 yrs. Now a days the cultivation of specialized vegetable crop becoming more popular among the other caste than the traditional one. Since last two year hybrid chilli cultivation was adopted by the other caste to harvest more money per unit area. Among the several hybrid chilli variety VNR-305 is becoming more popular for green chilli. In this regards, Sri Virendra Singh has been facilitated and motivated for vegetable cultivation on their land situated eastern border of the district. He was adopted two crops viz. tomato and chilli in the first week of july. 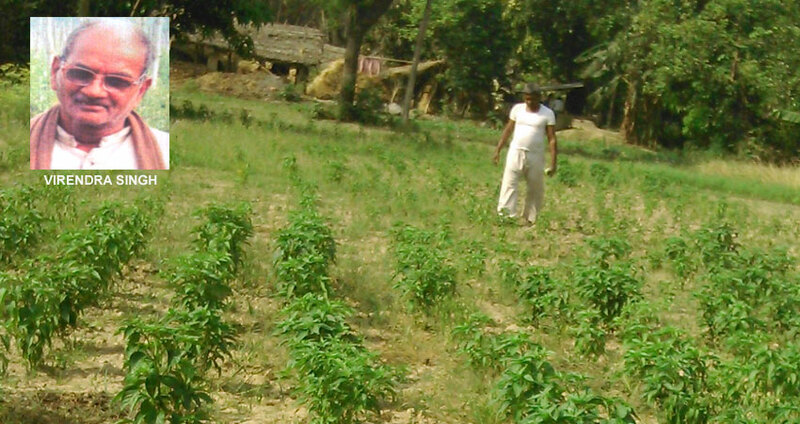 He has planted 1.5 acre VNR-305 var. of chilli and also associated another four farmers of Kadipur Tehsil and provided the same seedlings to them. The first picking was done 65 to 70 days after planting and up to the end of crops. Output / Outcome: Sri Virendra Singh earned as a gross income of Rs. 1.58 lacs from 1.5 acres of land, where as, Sri Pankaj Singh Rs. 1.35 lacs, from 0.8 acre of land, Sri Vinod 0.55 lac. from 0.4 acre by investing Rs.73000, Rs. 45000 & Rs. 11000 respectively . Impact : From this result more number of farmers has been motivated and purchased more than 10,000 seedlings of VNR-305 during the month of Feb. 2015 from KVK nursery .